Summit is currently working with a Northwest company specializing in Heat Recovery & Water Recovery Systems. We are providing engineering services for PLC automation, Wonderware HMI configuration, and field startup support. 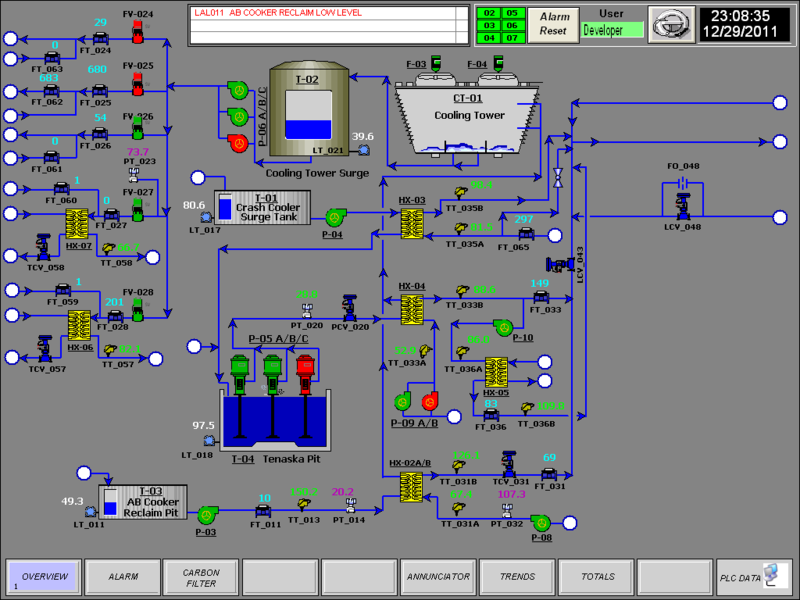 Complex system including several heat sources, water transport pumps, flow diverting valves and heat exchangers. Water and thermal savings are calculated and integrated in daily and accumulated values. The system is very dynamic with individual sources starting and stopping. Thousands of gallons in water and millions of BTU saved on a daily basis. New production line using Rockwell Automation Kinetix 6000 servo drives on multiple SERCOS rings. System required 7 ControlLogix processors for motion group coordination. This system required application engineering for approximately 100 servo drives. Additionally Summit was responsible for Wonderware HMI. Software was tested in the United State, we traveled overseas to commission, tune and take the system into production. The project was a great success and went into production ahead of schedule. Replaced an existing Allen Bradley PLC5 system consisting of six PLC5 processors with a new ControlLogix system. PLC5 processors were removed from the six processor racks. 1771-ASB modules were inserted to replace processors. These processor racks then became remote drops in addition to the 40+ existing remote I/O racks. A ControlLogix master rack was installed. System included a ControlLogix processor and six 1756-DHRIO modules to interface to the remote I/O network, Bailey DCS system and Reliance Drive system. Reconfiguration of the six existing RSLogix5 programs into one RSLogix5000 program allowed for a great deal of simplification; all inter-processor communication routines were no longer required. Paper machine logic was divided into "process area" routines. Database tag naming was completed in such a way to allow all field wire naming to be maintained. The original driving force for updating the system was a problem with intermittent communication errors. This problem was solved with the removal of all inter-processor DH+ communication. Additionally the new system allows updated control capabilities while providing a less complicated programming and troubleshooting interface. Replaced Modicon 984 PLC and Pushbutton controls with new ControlLogix PLC and WonderWare HMI solution. 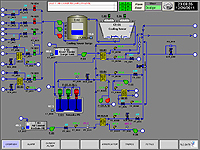 Industrial HMI computer was added in close approximation to the burners, allowing easy access to First-Out and alarm displays. We were able to maintain communication to the INFI 90 DCS by adding ProSoft MVI56MCM Modbus RTU interface module. This upgrade allowed easy access for maintenance personnel to perform scheduled safety checks of equipment. By maintaining communication with DCS we allowed system to be monitored and controlled from multiple locations. Summit replaced Reliance Automate 40E PLCs with new ControlLogix PLC systems. New ControlLogix system maintained existing connection to mill Honeywell DCS system via Prosoft Modbus RTU interface. Three complete digester systems were replaced over a 3 year period during mill outages. Descrete hardwired interlocks were replaced with ControlNet Network to each processor rack. The new PLCs are much more reliable and easier to troubleshoot when downs occur. The updated hardware and software allows for tighter control of machinery and more uniform production. Our engineers replaced a Reliance Automate 40E PLC with a new ControlLogix PLC system. Existing Operator interface was replaced with RSView SE Client/Server platform. The new HMI system is operating with 4 client windows allowing operators a much larger view into the process. The HMI alarm system was reconfigured. We were able to create a more descriptive troubleshooting tool with no misleading alarms indications. Controls enhancements are now possible without the fear of damaging code that was once hard to understand.